For a business looking to thrive in the long run, sustainability is really not an alternative, it is the only option. Diane Martin and John Schouten are avid spokespersons of the business benefits of sustainable marketing. 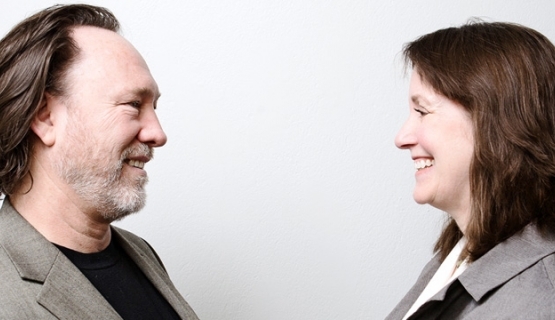 Known for their 2012 book Sustainable Marketing, Martin and Schouten are relatively new faces in the corridors of Aalto University. They moved to Finland from Portland, Oregon in the summer of 2012 and joined the Aalto faculty as Associate Professor and Professor, respectively, in marketing. According to Martin and Schouten, marketing has to step up and take on new responsibilities. Marketing has the means to play a vital role in creating a more sustainable society. The time has come to rise to the challenge. Two principles guide Martin and Schouten’s thinking: sustainable marketing and proselytizing sustainability. This means all marketing must be done in such a way that generates a reasonable profit and at the same time preserves or increases environmental and human wellbeing. Aalto’s new marketing professors would like to see marketing do more to spread the word of sustainability as a mode of operation for all businesses. As they see it, marketing should use its considerable influence to further a new way of looking at consumption: a world where consumption is based on sustainability. “Marketing has long been part of the problem. It has helped create an overly consumerist society. It simply cannot be on the sidelines anymore, sustainability is far too important for business,” Martin states. One of the biggest misconceptions of sustainability is that there is no business benefit. Schouten and Martin are fast to point out just how wrong this idea is. As they see it, sustainable marketing has a direct connection to both greater profits and long-term business health. “Sustainability is the path to competitive advantage in a global economy with a rising standard of living and limited resources. Companies that figure out sustainability first are the companies that will thrive. They have better access to resources as they will have already figured out how to use recyclable materials. They will save energy and, consequently, save money for other investments. They will have access to better workers as their employer image improves. Moreover, in order to become sustainable companies are forced to innovate, and innovation is a source of advantage. These are just some of the ways in which becoming more serious about sustainability creates a stronger, more sustainable company,” Schouten lists. Schouten and Martin claim sustainability equals profit and they are not alone in their claims. The 2012 sustainability & innovation global executive study and research report by The Boston Consulting Group and MIT Sloan Management Review backs their views in many ways. According to this year’s study, sustainability is paying off for a growing number of companies: profit from sustainability went up from 23 percent to 37 percent. Companies that have taken sustainability to heart report even higher rates. The Boston Consulting Group found that 59 percent of companies which have changed three or four of their business model elements report profit from sustainability efforts. Out of this group, companies that also put sustainability as a permanent fixture on their management agenda reach slightly higher profit rates, over 60 percent report profits from sustainability efforts. When asked to name a company making profit from sustainability, Martin and Schouten offer a name that might come as a surprise to some: Walmart. This giant by no means gets their full approval for sustainability, but in a number of ways, Walmart is on the right path and pocketing profits on its chosen road. “There are many stories about Walmart and its efforts to become sustainable, for example, the one about Walmart and its delivery trucks. Walmart saved millions upon millions when they installed relatively inexpensive power generators on their trucks. The auxiliary power units offered truck drivers amenities which allowed them to keep up basic functions even when the motor was not running. Previously they had to keep the diesel engines on,” Schouten explains. “After saving millions and shrinking their carbon footprint while they were at it, Walmart then took the money they saved and started collaborations to design even more energy-efficient trucks to save even more. This is the kind of positive cycle that companies can create when they choose to look at their business through a sustainable framework,” Martin adds. The auxiliary units on trucks alone added up to 25 million US dollars in annual savings for Walmart. Another example of Walmart’s CSR efforts that generate a considerable return on investment came from packaging waste. The company noticed that a reduction in size of the cardboard packaging of toy trucks created a two-fold benefit: it stopped hundreds of tons of cardboard becoming waste and saved Walmart 2.4 million dollars in annual shipping costs. Encouraged by such results, Walmart lifted the bar. Walmart’s aim is to reduce packaging across its supply chain by 5 percent this year. If they reach their goals, it could equal an environmental savings of 660,000 tons of carbon dioxide and an economic savings of 3.4 billion US dollars. Walmart is moving towards sustainability and getting a good return on its investment at the same time, but it still cannot be said to embrace a sustainable approach across its business. Asked to cite a company with a truly sustainable approach to its overall business, the professors name an Oregon based clothes manufacturer called Nau. “We have done a great deal of collaboration with Nau. They source natural, renewable fibers produced in a sustainable manner, create designs that are made to last and products that can be cost effectively repaired. They also donate 2 percent of every sale to the humanitarian and environmental organization Partners for Change and provide free public transportation for their employees. They also set salary limits; for example, their highest paid worker can only make 12 times as much as the lowest paid employee,” Schouten says with a smile. As a framework for turning a company and its marketing to a sustainable operation, Martin and Schouten recommend The Natural Step, which they used as a foundation to build their ideas on sustainable marketing. The Natural Step is based on systems thinking; recognizing that what happens in one part of a system affects every other part. It is freely available online and claims to have helped hundreds of different organizations around the world integrate sustainable development into their strategic planning. “The Natural Step creates an elegant and accessible framework for moving any organization towards sustainability at a fairly aggressive, yet optimal pace. It provides a science-based understanding of what sustainability is and a process by which companies can move towards sustainability in a way that does not compromise profit. With The Natural Step, we were able to show how every marketing decision can be optimized with respect to profits, the environment and social wellbeing,” Martin says. “Nike is a well-known example of a successful corporation using it, numerous universities have it, municipalities and communities have benefitted from it as well. The Natural Step Framework was applied at Whistler during the Vancouver Olympics with great results,” she continues. A systems approach guides Schouten and Martin’s thinking. The professors, for example, are all for lasting design but they do not see it as a necessity for creating a sustainable world. Limiting the world’s production is not the solution they are after, for even limited production still creates waste and uses valuable resources. “Our grandmothers’ approach to sustainability was creating products that lasted from one generation to the next. This is a great approach to sustainability and part of the solution, but not the only way nor a solution in itself. We need more companies taking a Cradle to Cradle approach to their production to keep materials moving and creating cycles with virtually no waste in production. This is how new production can be sustainable,” Martin points out. “The bottom line is it’s OK to produce more stuff if what you are producing is Cradle to Cradle. Using biodegradable and reusable materials, using green power, this is the way to go to make production healthy. From an economic standpoint it is good business, better than what you have now. It allows you to provide more goods and services and higher standards of living for more people – and the added benefit is that it will allow your company to do so for generations to come,” Schouten affirms.